A back to school(ish) special. Books featuring high school in America (with a subset of graduating), but sadly no glee clubs. Actually, if you can find a Young Adult fiction book published before 2009 that has a glee club in it I might have to find a spot prize for you. Read all of these and you’ll become an expert on American high school culture. Paper Towns, John Green. There are so many great elements to this book; a night of really cool pranking, a mysterious disappearance, a road trip, a high school graduation involving a daring lack of clothing, creative yet practical use of a recycled glass bottle… Looking forward to John Green’s next book. Twisted, Laurie Halse Anderson. One of my favourite young adult books. A tough story about people not necessarily having your best interests in mind, told by a really likeable narrator who takes things in his stride (mostly) until everything gets waaay out of control, and the only person who can help him is himself. Someday This Pain Will Be Useful To You, Peter Cameron. An excellent book, and although the narrative is mostly set in the time between school and college, there is a high school trip to Washington DC that is integral to the plot. This book kind of goes with How to Say Goodbye in Robot, and Like the Red Panda by Andrea Seigel in my mind. How to Say Goodbye in Robot, Natalie Standiford. What a great book. If you’re sick of love and mush and you want a good story about friendship then read this. Bea is Robot Girl (her mother says she lacks emotion and kindness) and Jonah is Ghost Boy, pale and virtually invisible in school. Together they make a great team, then things come to a head in Jonah’s life, and Bea learns just how ghost-like he is. Killer first sentence. I Love You, Beth Cooper, Larry Doyle. I haven’t read this but Simon says it’s funny, although I have heard it’s quite risqué too. Begins with high school graduation. Front and Center, Catherine Gilbert Murdock. I found this an interesting insight into the whole college sports scholarship scene. DJ is a fantastic basketball player (which you might know if you’ve read Dairy Queen), which means she’s basically got a free ticket to some of the best colleges in the United States, but the prospect of college b-ball and all the hysteria that surrounds it is not to be taken lightly. Plus there’s a love triangle for her to negotiate. Zombie queen of Newbury High, Amanda Ashby. Amanda Ashby lives in New Zealand – we interviewed her last year about Zombie Queen (and other things). Shift, Jennifer Bradbury. Directly after high school graduation, Chris and Win head off on a bike trip (as in push bikes), but then Win disappears and Chris determines to find out where (and why) he is hiding. Reality Check, Peter Abrahams. Mostly about not going to high school in America, since Cody drops out after he injures his knee (he was hoping for a football career in the NFL). Cody’s girlfriend goes missing from her boarding school, so Cody – since he doesn’t have school to worry about – investigates her disappearance, which seems sinister. Disappearances and high school: big in YA literature (ref #10, 9, 1, 4). FictFact is a site that tell you which book to read next in book series. Like, what’s next in the Gossip Girl : The Carlyles? (I chose that one at random!) This is handy, as there are SO MANY series out right now. It also recommends other series of books based on your preferences. There is a new trailer for The Last Airbender (which would be called Avatar but it might confuse people) that you can watch at the official site. I would embed it but that is forbidden! It looks to me – and I own all the DVDs so I am some kind of expert – that the film will follow the first series pretty closely. Which is good! You can borrow the series from the library. Not the second and third series though, as for some reason they aren’t available in NZ. 11.02.10 | Permalink | Comments Off on Watch Football For Free! For the Wellington Phoenix’s next home game, tomorrow Friday 12th Feb, under 16s can get in for free. Free! Just turn up with an adult and three of you can keep your wallets in your pockets as you walk through the turnstiles. Money saved at the gate can be spent on delicious (?) stadium hotdogs. If you’re older but still studying it’s only $20 anyway. Still a bargain then. Are you curious about science? Or do you love filmmaking but aren’t too keen on science? ReelScience is a competition for senior secondary school students (Yr 11 – Yr13) that starts on February 10th. To enter you’ll have to make a 2min short film on any aspect of science. There are cool prizes up for grabs like a Mac and film courses. This here clip tells you all about it (or check out their website). 09.02.10 | Permalink | Comments Off on Whip It! Whip It Good! The Soundtrack to Drew Barrymore’s Ellen Page starring, roller derby themed Whip It (called Whip it : music from the motion picture, of course) features songs from such great artists as Jens Lekman, The Raveonettes and The Ramones, but teasingly it does not include the song Whip It by Devo. Small matters aside, it’s really good. Listen to it as you and your friends beat each other up, whilst rollerblading. Another new soundtrack we have is (500) Days of summer : music from the motion picture. On it are songs by The Smiths, The Black Lips, Feist and Simon & Garfunkel. Relive all your favourite romantic-drama-comedy moments from the critically acclaimed film. We don’t have the DVD yet, but I’m sure that in due course, we will do. If you’re addicted to bass and desperately need a bass fix, lest you suffer bass withdrawl symptoms like the bass sweats, I suggest you issue Addicted to bass 2009. It’s yet another three CD Ministry Of Sound compilation with bass heavy hits from The Prodigy, Utah Saints, Dizzee Rascal, So Solid Crew, Groove Armada and others. With bass addiction becoming so prevalent, it’s lucky Ministry Of Sound provide a tonic. Art Spiegelman, Maus – this is a graphic novel, but it’s based on the experiences of the author’s father during World War II. Art Spiegelman won the Pulitzer Prize for Maus, being the first graphic novelist to do so. Anna Funder, Stasiland – A study of living in a state controlled by the secret service where every neighbour could be an informer. If you’ve seen the movie The Lives of Others this book will be especially interesting (and vice versa). It’s interesting anyway. Robert Mason, Chickenhawk – Robert Mason flew helicopters in the Vietnam War. Anthony Swofford, Jarhead – a soldier’s account of the 1991 Gulf War, and inspiration for the movie of the same name starring Jake Gyllenhaal. Nawuth Keat with Martha E Kendall, Alive in the Killing Fields: surviving the Khmer Rouge genocide. Wilfred Owen: Poems (selected by Jon Stallworthy) – Wilfred Owen was killed in action in World War 1. One of his most famous poems is ‘Anthem for Doomed Youth’. This Week’s Magazines is a new regular (perhaps?) 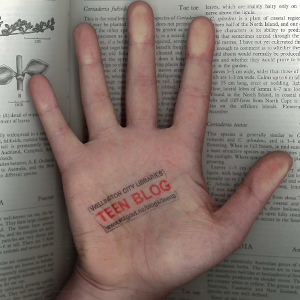 Teen Blog feature. Here are this week’s latest arrivals from the Young Adult Periodical Department. There are not many new books this week. But there are enough to keep you going. Hunger, by Michael Grant (600 pages) – This weighty tome is the sequel to Gone (we mention it here), and here is its official website. Which will save me writing a synopsis! Hell’s Heroes, by Darren Shan (235 pages) – This here book is the tenth in The Demonata series. It is also the last! Luckily for me it too is a series with its own website. The copy I have here is signed by the author btw. The Uninvited, by Tim Wynne-Jones (351 pages) – Catalogue says: ‘After a disturbing freshman year at New York University, Mimi is happy to get away to her father’s remote Canadian cottage only to discover a stranger living there who has never heard of her or her father and who is convinced that Mimi is responsible for leaving sinister tokens around the property.’ The tokens are are like dead animals and creepy, Blair Witch-like things. Creeeeepy. Blue Plate Special, by Michelle D. Kwasney (366 pages) – Three girls from different decades (70s, 90s, and the 00s) learn about empathy, forgiveness, and self-respect as their stories weave together. Nothing But Ghosts, by Beth Kephart (278 pages) – Katie’s mother has died and she is left to live with her genius, art-restoring father in a massive old house. She gets a job at an estate and along with a pair of brothers and a ‘glamorous librarian’ (obviously all librarians are glamorous) she ‘soon becomes embroiled in decoding a mystery.’ ‘Heartfelt, lyrical,’ says the blurb. Lips Touch : Three Times, by Laini Taylor (265 pages) – Here is collected three stories (all nicely illustrated, in my opinion!) about romance. There is a strong fairy-tale/supernatural flavour to each story as well. Alice in Love & War, by Ann Turnbull (324 pages) – 1644, England, and the Civil War leads an army of Royalists to Alice Newcombe’s uncle’s farm. She falls in love with a soldier, Robin, and leaves the farm to travel with him (well, she travels with the other army women). Blood Ninja, by Nick Lake (369 pages) – This has ninjas. It also has vampires. It is set in imperial Japan. What more could you possibly want in a book? NOT MUCH. “A fast-paced, gripping book with ninjas. It’s all I ask for, really.” – Conn Iggulden, author of The Dangerous Book for Boys.